El panitumumab es un tipo de inhibidor del receptor del factor de crecimiento epidérmico (Epidermal Growth Factor Receptor Inhibitor, EGFRI), que se ha asociado con diversos efectos dermatológicos secundarios. Este medicamento se ha usado para el tratamiento del cáncer metastásico de colon. Se reporta un caso de una mujer con hipertricosis secundaria al uso de panitumumab y se discute su fisiopatología. Panitumumab is a type of Epidermal Growth Factor Receptor Inhibitor (EGFRI) that belongs to the new antineoplastic therapeutic strategies associated with dermatological adverse effects. Panitumumab has been used for the treatment of metastatic colon cancer. 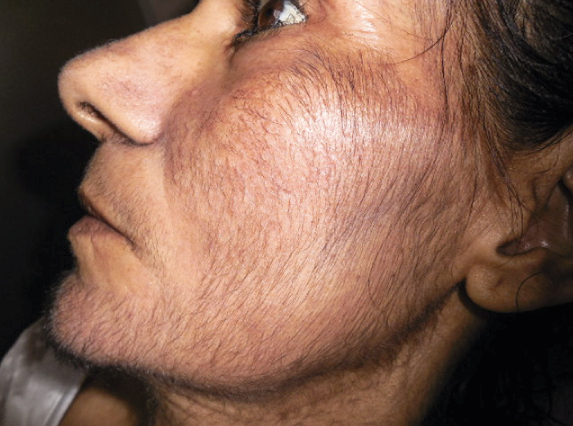 We report the case of hypertrichosis secondary to panitumumab and we discuss its physiopathology. 1. Cohen PR, Escudier SM, Kurzrock R. Cetuximabassociated elongation of the eyelashes. Am J Clin Dermatol. 2011;12:63-7. 2. Françoso A, Simioni PU. Immunotherapy for the treatment of colorectal tumors : Focus on approved and in-clinical-trial monoclonal antibodies. Drug Des Devel Ther. 2017;11:177-84. 3. Lacouture ME, Anadkat M, Jatoi A, Garawin T, Bohac C, Mitchell E. Dermatologic toxicity occurring during anti-EGFR monoclonal inhibitor therapy in patients with metastatic colorectal cancer: A systematic review. Clin Colorectal Cancer. 2018;17:85-96. 4. Wu PA, Balagula Y, Lacouture ME, Anadkat MJ. Prophylaxis and treatment of dermatologic adverse events from epidermal growth factor receptor inhibitors. Curr Opin Oncol. 2011;23:343-51. 5. Alexandrescu DT, Kauffman CL, Dasanu CA. The cutaneous epidermal growth factor network: Can it be translated clinically to stimulate hair growth? Dermatol Online J. 2009;15:1-6. 6. Glas J, Török HP, Folwaczny C, Schneider A, Stolte M, Brünnler G, et al. Abnormal hair growth in a patient with head and neck cancer treated with the anti-epidermal growth factor receptor monoclonal antibody cetuximab. J Clin Oncol. 2005;23:5272-3. 7. Cignola S, Gonella S, Alessandra B, Palese A. Monoclonal antibody-induced papulopustular rash: Clinical course, communication to health-care professionals and reactive measures as reported by patients. Eur J Oncol Nurs.2016;20:133-9. 8. Berner D, Schlegel C, Metzler G, Ro M. Facial hypertrichosis induced by cetuximab, an antiEGFR monoclonal antibody. JAMA Dermatol. 2006;142:1656-7. 9. Li T, Pérez-Soler R. Skin toxicities associated with epidermal growth factor receptor inhibitors. Target Oncol. 2009;4:107-19. 10. Baykal C, Babuna kobaner G. Hypertrichosis of the pinnae in a patient using panitumumab. J Eur Acad Dermatol Venereol. 2018;32:e277-8. 11. Wendelin DS, Pope DN, Mallory SB. Hypertrichosis. J Am Acad Dermatol. 2003;48(Suppl.2):161- 79. 12. Imbernón-Moya A, Podlipnik S, Burgos F, VargasLaguna E, Aguilar-Martínez A, Fernández-Cogolludo E, et al. 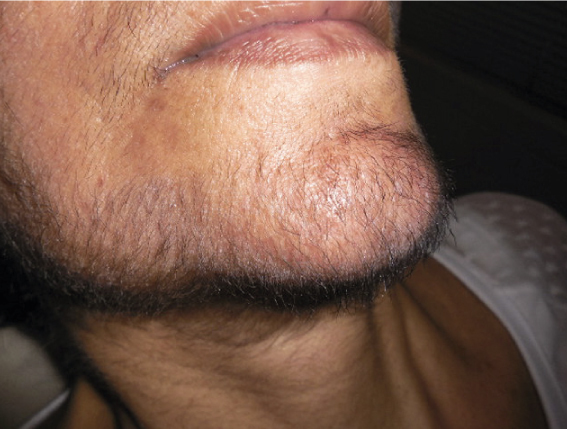 Acquired localized hypertrichosis induced by rivastigmine. Case Rep Dermatol Med. 2016;2016:1-3. 13. Wollenberg A, Kroth J, Hauschild A, Dirschka T. Hautreaktionen unter EGFR-Inhibitoren – Klinik und Management. DMW - Dtsch Medizinische Wochenschrift. 2010;135:149-54.